By Allan Fox: Adrien Broner (30-3, 22 KOs) says he’ll be cutting off the media as far as him giving interviews before his upcoming fight against Khabib Allakhverdiev (19-1, 9 KOs) on October 3rd in Cincinnati, Ohio. 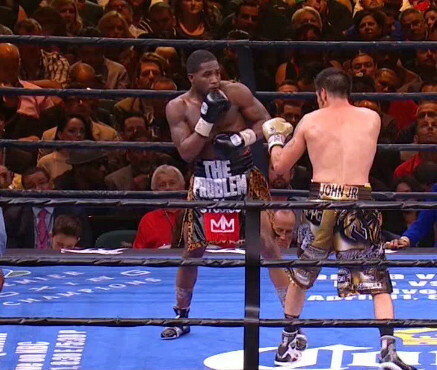 Broner and Allakhverdiev will be fighting for the vacant WBA World light welterweight title. Broner even said he won’t be doing anymore press conferences. I don’t know how he’s going to be able to avoid taking part in press conferences, because things like that are usually written in the contract that fighters must participate with them. Broner says he wants to get serious about his seven-year pro career, which has gone downhill as of late with his 12 round decision loss to Shawn Porter last June. Another loss for Broner will pretty much wreck his once promising career and leave him with some poor options. Broner doesn’t appear to be good enough to beat the best fighters in the 140 and 147 pound divisions. If he loses to the 24-year-old Allakhverdiev too, then Broner will need to think seriously about moving down to lightweight to try and reestablish himself at that weight. “And for all you reporters the new AB [Adrien Broner] don’t do interviews so if you see any press release comments just know that ain’t me saying that [expletive]!” Broner said on his Twitter. “I gave up a lot of things that was bad for me even though I thought it was fun ….#NoMorBadNightsOfBoxing #NMBNOB. I will only talk after my fight for here on out….. No more press conferences No NOTHING!!!! It’s unclear why the 26-year-old Broner feels that cutting off the media will help matters with his career. It seems like the reasons why he lost to Porter and Marcos Maidana in the past was the result of poor training, and a failure to adapt to what those fighters were doing inside the ring. Perhaps Broner feels that he’s spending too much time with the media giving interviews and not enough time training. If that’s what Broner believes then he’s kidding himself. Some boxing fans feel that Broner isn’t dedicated enough to his craft, and is more focused on living it up and trying to become a rap star. If Broner isn’t putting his entire focus on his boxing career, then it would explain why he’s not looked good since he left the lightweight division. Broner obviously needs to be 100% dedicated to his craft, and he needs a good trainer for him to turn his career around. You can make an argument that he’s not getting either of those things at this point in his career. “People can hate on me but guess what I’m rich and I’m go keep it that way…….The new and improved Adrien Broner is about boxing that’s it,” Broner said. I don’t think people dislike Broner because he’s rich. I think a lot of boxing fans dislike Broner because they feel he emulates Floyd Mayweather Jr., but without the same dedication, talent and experience that you see from him. Broner has won three division world titles, but he’s done it each time against weak opponents in Vicente Martin Rodriguez, Antonio DeMarco and Paulie Malignaggi. Broner never had to fight someone really good in those three weight classes. If Broner were still at super featherweight, lightweight or welterweight now, he would have to fight someone talented if he wanted to win a world title in those weight classes. I don’t know if he could do it. “I’m back on Showtime, so [expletive] all the bull [expletive] the real AB is back and Oct 3rd I will be 4 time world champion in 4 different weight classes,” said Broner. Broner has a better than average chance of defeating Allakhverdiev to pick up the vacant WBA “regular” 140lb title, but I don’t think the victory will do much for Broner’s career. He’ll likely be seen as a paper champion due to him fighting Allakhverdiev, a guy who hasn’t fought in over a year since getting beaten by Jessie Vargas in April 2014. For Broner to impress the boxing fans and make him seem legit, he would have to beat guys like Lamont Peterson, Lucas Matthysse or Terence Crawford. I don’t think Broner could beat any of those fighters. Broner doesn’t throw enough punches to defeat those guys, and he wouldn’t be able to clinch his way to a win like he tried to do against Porter last June. Instead of Broner cutting off the media, he should be looking to find a good trainer that can fix all the flaws in his game, because he needs some serious help. He’s been with trainer Mike Stafford for a long time, but I think Broner needs a new trainer that can help him improve. He should get with Freddie Roach or maybe Robert Garcia. He needs someone who can look at his flaws and come up with some new strategies to fix them. It would help if Broner were to increase his work rate considerably. Instead of averaging only 25 punches thrown per round, Broner needs to be averaging 70+. I don’t think that’s going to happen if he stays with Stafford and keeps fighting the same as he’s been fighting.